Monday June 3rd 1878 We did not wash this morning. I helped with the housework and got my dress partly cut before dinner. I sewed all the afternoon. I did a little mending in the evening. Went to bed rather early. Weather very much cooler. 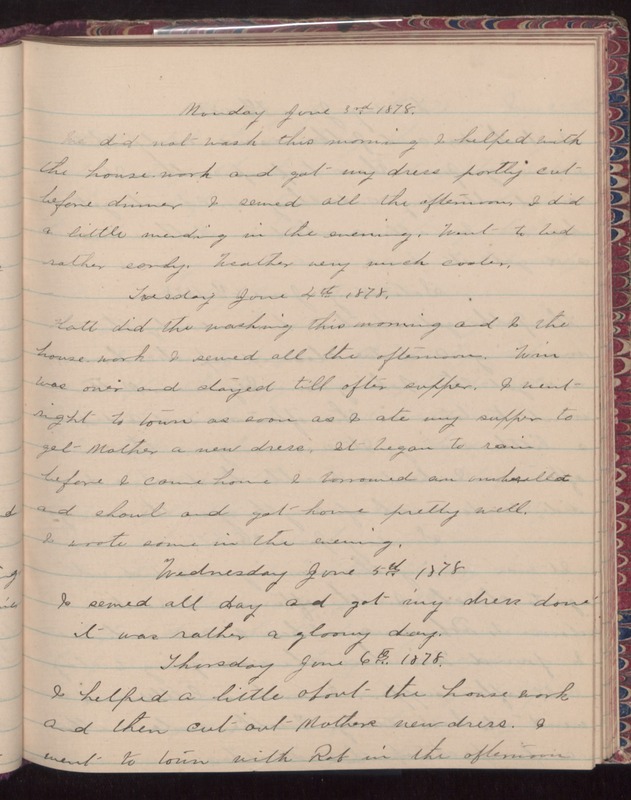 Tuesday June 4th 1878 Hatt did the washing this morning and I the house-work. I sewed all the afternoon. Win was over and stayed till after supper. I went night to town as soon as I ate my supper to get Mother a new dress. It began to rain before I came home & borrowed an umbrella and shawl and got home pretty well. I wrote some in the evening. Wednesday June 5th 1878 I sewed all day and got my dress done. It was rather a gloomy day. Thursday June 6th 1878 I helped a little about the housework and then cut out Mothers new dress. I went to town with Rob in the afternoon.